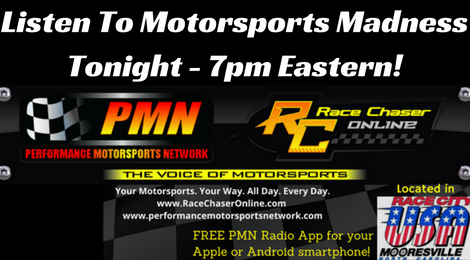 MOORESVILLE, N.C. — The Performance Motorsports Network’s live Monday night racing lineup gets the green flag at 7 p.m. Eastern time when the Race Chaser Online crew of insiders gather at the roundtable in Race City USA to tackle all the hot topics of the weekend on Motorsports Madness. Join Jacob Seelman, Tom Baker, James Pike and Rence Brown as they take a no-holds barred look at what happened over the weekend when NASCAR invaded New Hampshire Motor Speedway and Kentucky Speedway for Chase action. Analysis of the on-track action, as well as the crew’s thoughts on which drivers’ Chase bubble may be about to burst in all three national series, will commence at the drop of producer Bob Steele’s green flag. Other issues to be tackled in the two-hour show include the rapidly heating up IndyCar silly season and who will be left out when the musical chairs stops for 2017, as well as a recap of NHRA’s second playoff race weekend in St. Louis at Gateway Motorsports Park. Turn 5 Live co-host Steve Ovens drops by to dish the dirt on the World of Outlaws sprint cars and other news and notes, and the crew will also get fans caught up on some of the top regional racing stories as well. Race Chaser Online is a national motorsports news site based in Race City USA — Mooresville, N.C. RCO is dedicated to bringing you “Your Motorsports, Your Way,” with news, views and interviews from around the globe. Insiders from go-karts and Legends Cars to NASCAR, IndyCar, Formula 1, dirt tracks and Australian Supercars provide exclusive unique content all week long as they gather news from across the motorsports landscape. Turn 5 Live is a New York-based weekly dirt-track affiliate of Race Chaser Online and PMN Radio, airing live on Tuesday nights at 7:30 p.m. Eastern on the Performance Motorsports Network.